Awaken love within the hearts of men. David Robertson, who is the Executive Director of Independent schools in Queensland, spoke about NAPLAN and the intention of the Government to take it online. There was also a report from Karen Brice-Geard on the progress in NZ towards the accreditation of their NZ Senior Certificate. We were also treated to a wonderful performance by the students and teachers of the school, of a composition created by the head of their music dept. for “Waldorf 100”. Waldorf 100 is a world-wide celebration of the introduction Waldorf education. This is connected to the Postcards you may now be aware of. It is also a good opportunity to catch up with some old colleagues and find out what is happening in other schools. The school is committed to ongoing Curriculum reviews which commenced recently beginning with the Music program. This will involve all the teachers and the music department. Reviews are always a good opportunity to explore the questions of why and how we do things, sometimes this may precipitate change but only with the goal of enhancing our programs. Music can be an inspirational element in a Steiner School which is holistically embedded in the fabric of the community. We will be looking at all aspects of music, from the approach to music in the classes, to the strings program and how music interfaces with Festivals, fairs and the broader community. Springtime is on its way, Winter goodbye. Very special thanks to Kate and Christine for looking after the children while I was on long service leave. Everyone was very happy and relaxed when I returned and spoke warmly of their time with Kate. 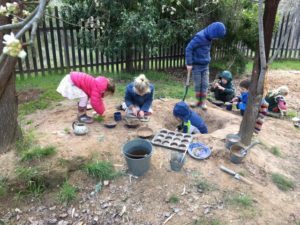 There has been lots of excavation this week creating a lovely supply of fine dirt perfect for mud pies, cakes and other things of a gooey consistency! Please don’t forget those spare clothes. 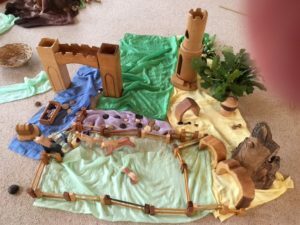 The children are also enjoying creating story landscapes and puppet plays during inside play. Our Spring Festival will be on Thursday 21st September. It feels like lady spring has been creeping towards us, and King Winter has been slowly retreating for a few weeks now. Today though our beautiful garden is filled with sunshine and frolicking children! I am very pleased to welcome the change in seasons. 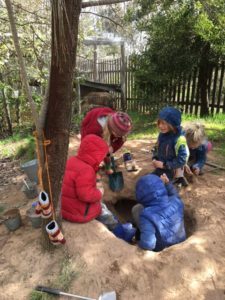 The children seem ready to take their next growth leap: Appetites have been increasing, there has been sleeping in the afternoon and lots of delightful running around our blossom and bulb filled garden. Even Betty our chicken is clucky! Our newest member of our Kinder family – Tahi has settled in beautifully. It is lovely to have her with us. Note to remember: Please bring hats next week, it is time to wear our summer hats again (1st September). Invites for the Spring Festival will be in your pigeon hole next week too! All the best and warm regards, Tobie. We are looking at squares and the four times table and goals and points’, amongst the many beautiful flower petals for the six times table! (due to some interesting discussions taking place amongst some children) Also of great interest is that times , plus , minus and divide are cousins and why are they connected. We begin our English Main Lesson from the Celtic Legends this week . Our Class Play has been delayed until term for due to so much illness amongst the class. We are presently working with the Old Testament story of Moses in our English main lesson as well as practising our vertical sums. The class have done a wonderful job with their individual presentations of their Houses and Shelter projects and received positive feedback from their peers and myself. The house projects will remain on display in the library until the last week of term. There may also be an encore for the Spring Fair Craft and Curriculum display in term four. Next term we shall begin our whole class building project! Class 5 finished off their first Greek Main Lesson with some Greek dancing and a wonderful feast. We are practicing hard every week for The Olympics, which will be held with 7 other Steiner schools at Mansfield Steiner School on Thursday 23rd November and Friday 24th November. Our discus throwing has improved greatly. Thanks Jose for coming in most weeks to help us with technique. ‘Behold the Plant! It is the butterfly bound to Earth. We now embark upon the Botany Main Lesson, observing, feeling the mood of and caring for the plant kingdom. Some beautiful illustrations are being carefully drawn in main lesson books and we have found that there are so many different types of seeds. For this lesson we shall be venturing outside quite often, so students need to have waterproof footwear every day please. On Mondays and Wednesdays it is also important for everyone to be wearing appropriate footwear for sport. The oak and beech made strong the lands And hid the deer from hunter’s hands. The people loved him from the start And called him bravest Lionheart. But soon he rode to far-off lands To join the brave Crusade. And in his place his brother stepped ‘Prince John, the renegade. And he alone could hunt the deer That roamed from shore to shore. Against Prince John he took his bow And gave his heart to the poor. So begins the Prelude to the play soon to be performed by Class 6. Please note that dates and arrangements have changed for the Robin Hood Play Performances. They will be on Tuesday, 12th. September for classes and the final evening performance at 7 p.m. Wednesday, 13th.September. Each family are asked to send a supper plate to share after the evening performance. This will be followed by the Lyell Forest Plant Study camp in the last week of term – Monday 18th, 19th, 20th. September. This camp will involve several third year Outdoor Ed. Students and their supervisor and is located in the forest just west of Kimbolton Pool, Lake Eppalock. Further information, forms Clothing and Equipment lists will be sent home at the end of this week. What a wonderful spring like day we experienced on Monday this week! I had originally planned to continue our gymnastics unit in the MP Hall, but thankfully with the space being needed by our Music Team for concert rehearsals, we moved outside and what a marvellous decision it turned out to be! We first played a few mini games using some basic low to the ground gymnastic ‘travels’ (ways of moving) that we had previously been introduced to. To finish the session we moved through the various playgrounds of the school in a parkour type manner, viewing each section as a challenging obstacle to overcome. Effort and persistence was rewarded with success, but the real reward was to be outside in our wonderful community, enjoying each others’ company and physical achievements, whilst basking in the glory that Mother Nature had provided. Not only did it warm our bodies, but our hearts and spirit also. We move onto circus skills in the upcoming few weeks. Last year we were able to use some fantastic equipment kindly lent to our school by Castlemaine Circus. I hope to arrange something similar this year as the children absolutely loved our sessions last year. I’m very excited about this upcoming unit and seeing how the children’s skills have developed. If all goes to plan within this busy term, we hope to put on a performance for the school later this term or early Term 4. Exciting times ahead! Enjoy the warmer weeks ahead and get active! A brief roundup of French classes as we move ever closer to the first day of spring, le printemps. In Class Six we have been practising the use of the question Qu’est-ce que c’est? – What is it? – and brushing up on our dictionary skills to come up with some interesting answers. Students showed great detective skills in guessing animals, colours, even foods – although the award for the most unguessable food was certainly for the student who found hachis parmentier … meaning shepherd’s pie! Class Seven and Eight have caught up with some basic weather expressions and are very familiar with le froid, le brouillard and les orages – cold, fog and storms, after such a long winter. But we are certainly hoping very soon to have good reason touse our vocabulary for springtime – il fait beau, le soleil brille – it is a beautiful day and the sun is shining! There has been an increase recently to the number of parent to parent messages coming via the Office. Please note that your Class Carer is the first point of contact for all parent details, phone numbers etc. The Office is happy to assist in urgent scenarios, however non-urgent and non-educational messages will need to be arranged via your Class Carer. There have been a few near misses this week with vehicles not adhering to the “STOP” sign whilst exiting the school. Please ensure your own personal safety and the safety of others during pick-up and drop off each day. A note from Mansfield Steiner School re their new Year 9 class! Castlemaine Secondary College - Little Shop of Horrors! My name is Kimmy Sexton, I am a single parent of Isobella Sexton-Kueffer of Class 2. Isobella and I reside in Huntly, (north of Bendigo,) however we shall be relocating to Castlemaine, hopefully in the very near future. Currently, Isobella attends the after school care program at Campbell’s Creek and I work in the Bendigo CBD. I am looking for some transportation assistance, after school, Friday’s. We were wondering whether anyone drives to Bendigo after school on a Friday, who wouldn’t mind dropping Isobella off at my office, opposite the Good Loaf in Bendigo. It would help enormously and alleviate the need for me to drive to Campbells Creek and back to Huntly on a Friday night. If you could help, please call / text Kimmy on:- 0427 046251.